Your website and CRM can take great advantage of custom tracking links for tracking individual prospects and their actions, e.g. whether or not they opened your website and signed up for your services, and how they got there (e.g. email from Woodpecker, web ad, another website). You can use custom tracking links (including UTMs) in your campaigns in Woodpecker. You need two ingredients for that: a prospect database containing the custom links, and correctly edited email copy that uses them. Update your prospect database in Woodpecker to include the custom links (e.g. in the Snippet 4 field). This can be done quickly with a CSV upload. Edit your email copy in the campaign, and add any link to the text fragment that you want to contain the custom link. Switch to HTML view, find your "any" link, and replace the URL with your selected snippet. Create a spreadsheet with your prospect base, including your custom links, and save it to a CSV file. "Email" and "Custom Link" are the two columns that are required. Optionally, you can add other columns for additional info, such as "First Name", "Company" and "Website". The custom links in your file should be full addresses, i.e. they should start with http:// or https://. Sample prospect list with custom links that was uploaded to Woodpecker. Select "Update the existing contact with changed or new fields" to allow updating the prospects that are already in your database (if any). 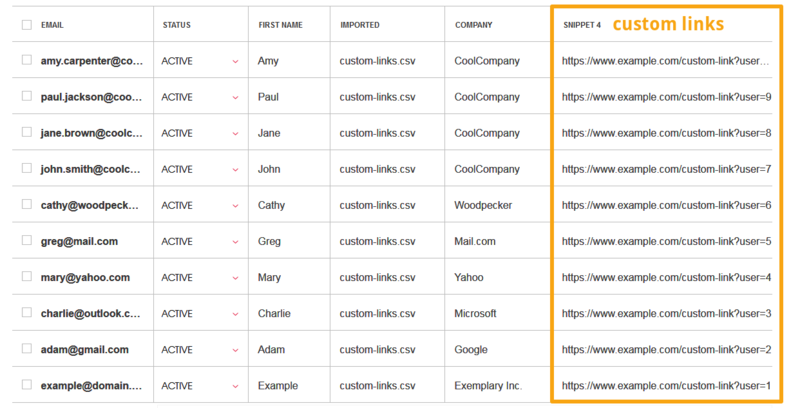 When mapping fields from your file, choose the snippet field that you want to use for the custom links, e.g. Snippet 4. Finalize your import and view the summary. Check if the prospects were added to your campaign. You can automate this process with PieSync, which allows for easy management and synchronization of databases between apps. PieSync will help you to move the custom links from your CRM directly to Woodpecker. Edit your campaign, and use the selected snippet to create custom links in your emails. After adding a link to the selected text fragment in your email copy, you will need to replace its address (in HTML view) with your selected snippet. Type or paste any address (e.g. https://google.com/) into the dialogue box, and click "Add". Click the button </> "html to txt" (that's the last one). Press Ctrl and F (Cmd and F on Mac) to find your link – just type in the text fragment for which you created it. The part mail text fragment, as in the sample above, will be your text that contains the link. You need to replace the link to the left of it (in this example: http://www.link.com/) with the snippet that you chose previously. Please make sure you didin't accidentally delete the quotation marks. The link should be put between them. Don't hesitate a second to contact support if you are having any trouble with this – these guys will gladly give you a hand. Tap <Backspace> on your keyboard, and select your custom link snippet from the panel on the right. Click the </> "html to txt" button again to go back to normal view. You can click "preview campaign" at the bottom (next to the grey button "Save as Draft") to check if the links are being created properly. If it's a "check" – congratulations, your emails in this campaign will now include a custom link for every prospect. Select the text fragment that should contain the custom link, and click the button "Create Click Link", in the formatting bar above.